A few posts ago, I wrote about where students of certain ethnicities went to college. In other words, if you looked at all the Hispanic students in the US, we'd want to see where they go to college, and compare that to Asian students, or students of two or more races. I asked whether a student's ethnicity determined where they go to college. 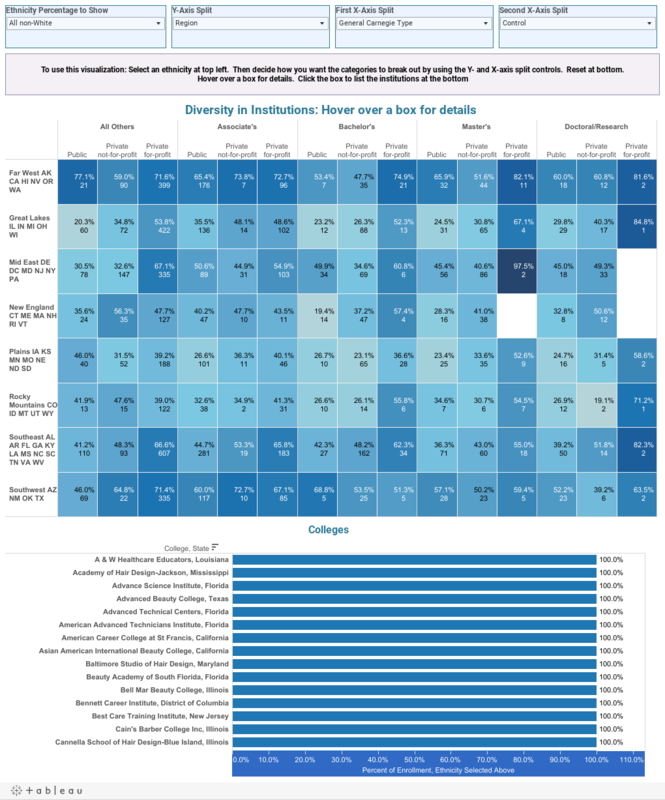 This is the same data, but it examines it at the other end: The colleges, and how diverse they are. In other words, does your location, control, and size, and Carnegie Type, for instance, determine how diverse you are, or limit how diverse you can become? Again, the answer is no, but you can find some interesting trends. If you're timid about using Tableau and interacting with it, here's your chance. First, choose an Ethnicity in the top left corner. For instance, assume you want to display the percentage of enrollment that is Asian. Choose how to display the x-axis using two controls. If you want just one dimension along the x-axis, make it the same variable for both x-axis controls. Using the default values, look at the top right box. This means that at the two private-for-profit Doctoral/Research Institutions in the Western States, the undergraduate enrollment is 81.6% non-white. Hover over the box for details. Now, click on that box, and the bar charts at the bottom update to show you those three schools, and the percentage of the student body of the ethnicity indicated. There is a LOT to play with here. What do you notice?